Dr. True has extensive experience with chronic pain and neurological conditions resulting from spine related disorders. He is involved with research and clinical application of laser therapy for neuromusculoskeletal disorders. 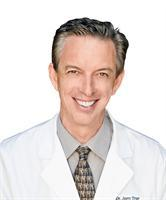 He is a board director for the North American Association for Laser Therapy (NAALT). Dr. True has lectured for the Florida Chiropractic Association and the International Academy of Chiropractic Neurology for continuing education on topics of laser therapy and neurology. He has also lectured for many other academic venues throughout America. I have been to MANY Chiropractors in my lifetime for back and neck pain. Dr. True's Concierge Chiropractic approach for working professionals and retiree's is entirely different. I really like the fact that Dr.True takes the time to LISTEN to me while I discuss my discomfort zones and pain level. I am grateful for his advice and suggestions for my particular specialized treatment... especially the deep penetrating LASER heat technology for pain relief. WOW Does It Work!